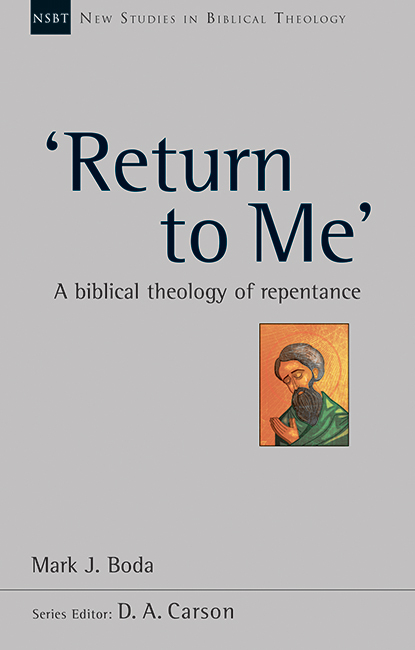 Over the summer, Mark Boda published a new book entitled Return to Me: A Biblical Theology of Repentance (IVP, 2015). Boda is a well-respected OT scholar at McMaster Divinity College. About nine months ago or so, Boda kindly sent me a copy of the manuscript because I was working on research related to this subject. I was very impressed with his work. Firstly, I value that he allows for different parts of Scripture to have their own nuances regarding repentance. Secondly, I appreciate that he did not just treat the Old Testament, but includes a short, but important section on the New Testament. The significance of this work, for my part, is that Boda avoids the fallacy of treating the OT as covenantally-focused (expectation and obedience), and the NT as one-side (“grace only”). Rather, Boda demonstrates how patterns of divine-human interaction and expectation continue from OT to NT – repentance (from a relational-perspective) is present and important in the NT in ways congruous with the OT. I think that the subject was too large for Boda to do more than soundings and big-picture work, and his NT section is very cursory, but this is a major step in the right direction of thinking about covenant, obedience, and repentance in a holistic and whole-Bible way. I hope someone will continue to study how covenantal repentance is at work in the New Testament (in its pluriform ways). A good resource on repentance in the NT is The Role and Function of Repentance in Luke-Acts by Prof. Guy Nave. His work, based on his Yale PhD, does a great job in a lexical and theological examination of the concept across the Hellenistic literature, LXX and the NT, with the emphasis on Luke-Acts. Prof. Nave was the translator of Luke’s Gospel in the Common English Bible. Seemingly, his understanding of Metanoia and cognates is reflected in that translation, a dual changel of heart and life. One surveys the texts, the second summarizes this data into a coherent New Testament “biblical theology of repentance. For the most part, Boda finds the same themes in the New Testament as the Old.